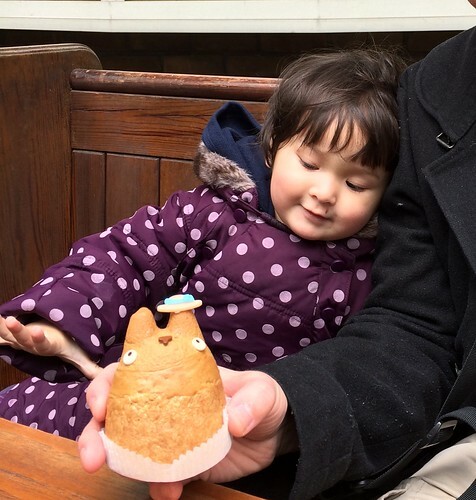 I've always loved the Studio Ghibli film My Neighbour Totoro and now that I have a two year old daughter, I love it even more since we watch it together. 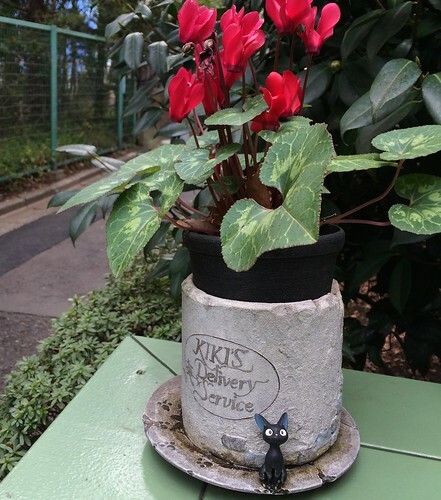 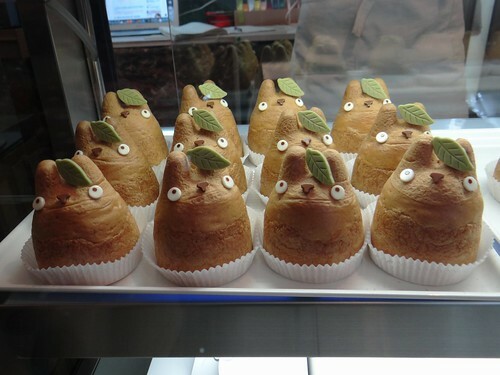 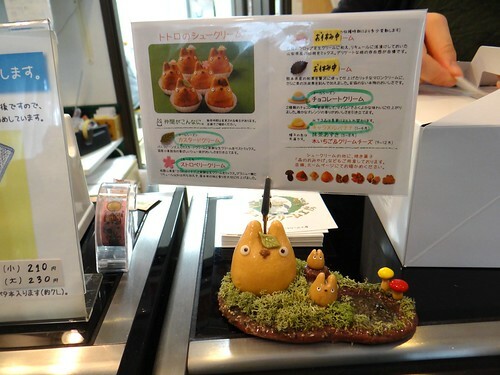 So when we went on holiday to Japan last month, I made it my mission to take her to Totoro's Bakery. 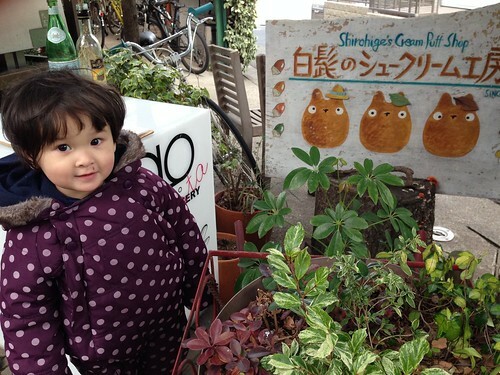 What my daughter calls Totoro's Bakery is actually known as Shirohige Cream Puff Factory. 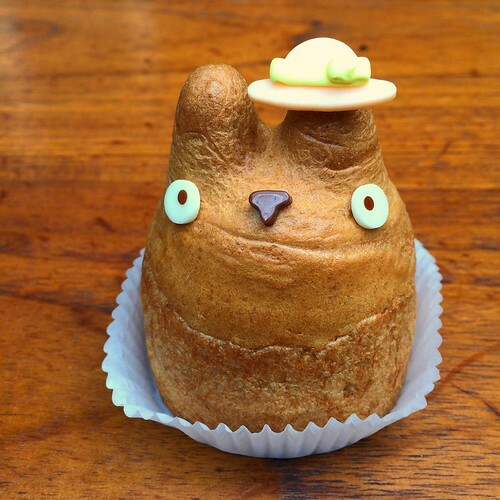 It was set up in 2008 by a baker whose nickname is Shiro Hige ie White Beard. 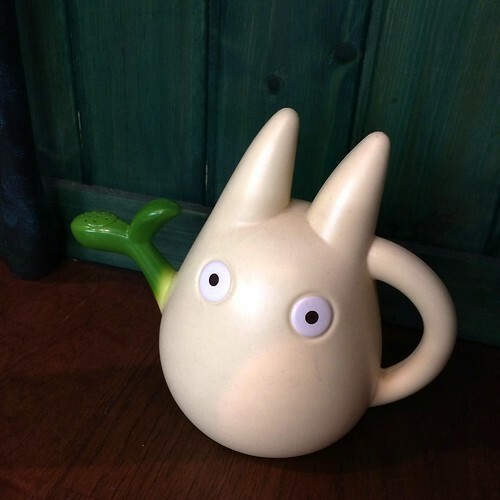 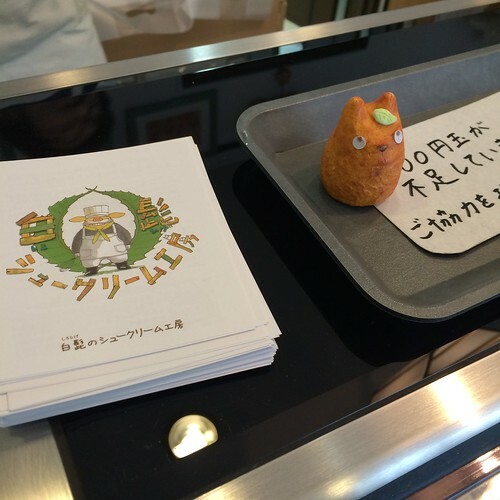 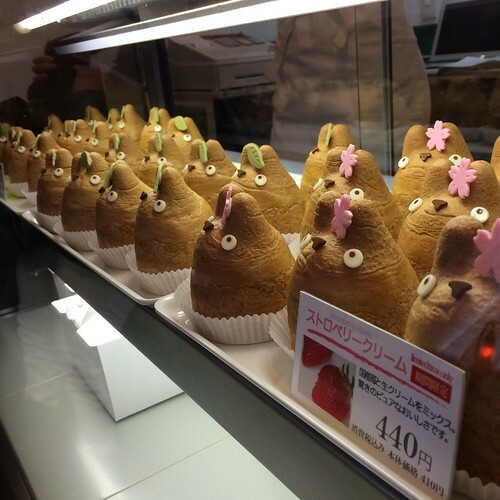 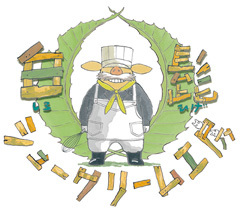 Hayao Miyazaki, the founder of Studio Ghibli and the director of My Neighbour Totoro even created a pig-nosed character for Shirohige which appears in various guises throughout the bakery. 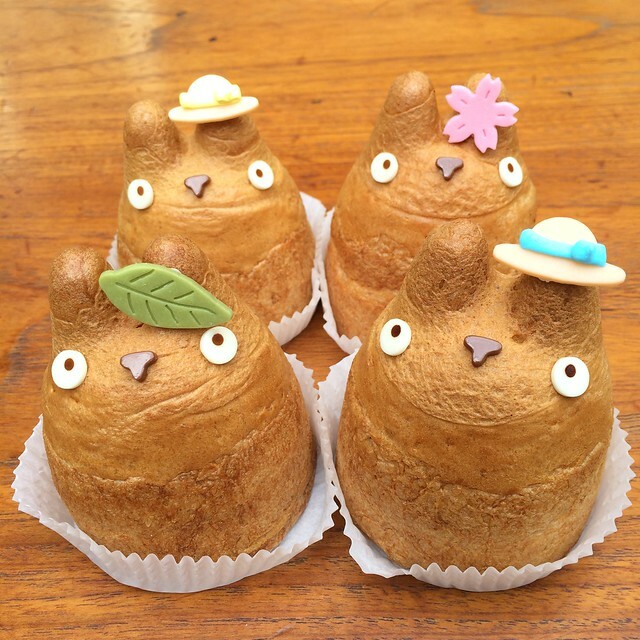 I've read that Miyazaki's family actually own the bakery, and indeed the "About Us" page on their website states that the President is Kyoko Miyazaki so this may well be the case. 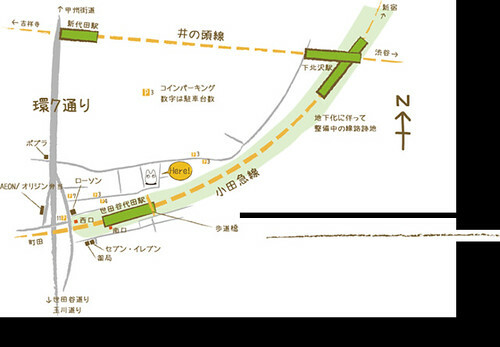 The bakery recently moved to new premises in Setagayadaita and so we trekked out using trusty Google maps. 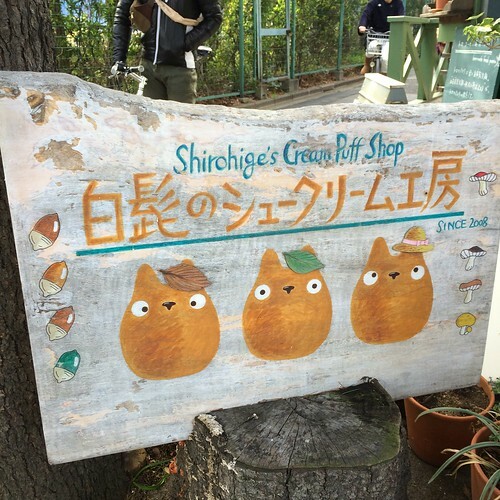 It's tucked away in a quiet, residential street and at first we thought we'd taken a wrong turning, but soon we were rewarded with this adorable sign with its fat little Totoros. 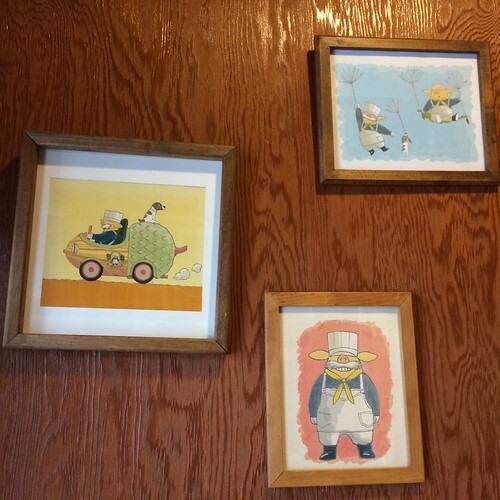 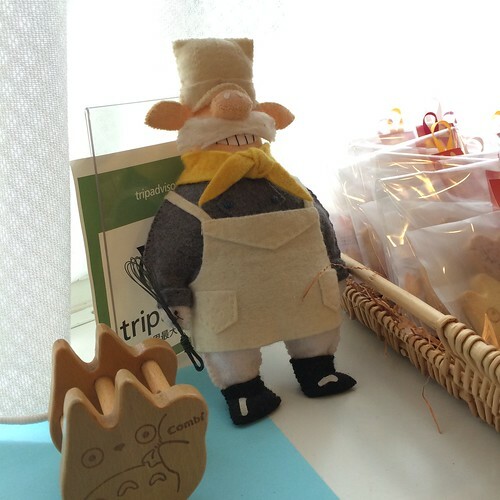 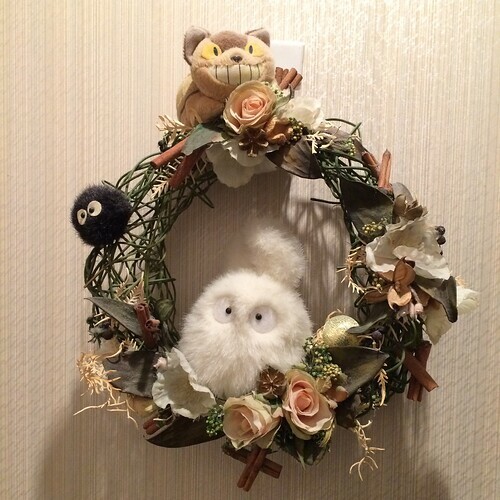 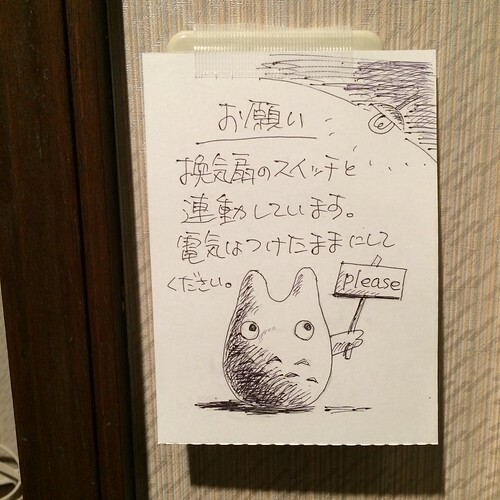 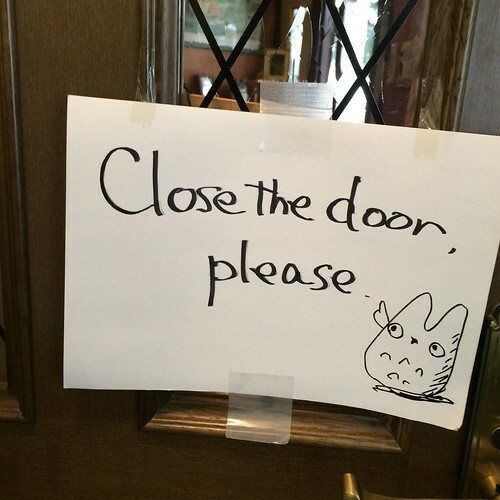 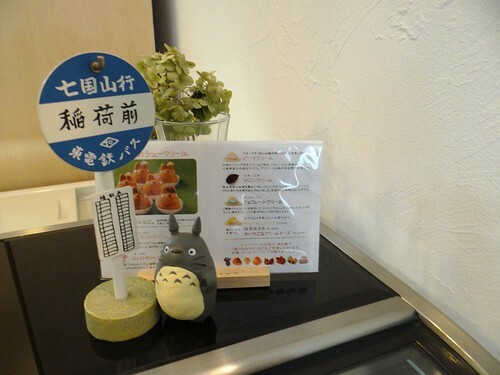 The entrance is decorated with cute pictures of Shirohige the baker, as well as other Totoro ornaments. 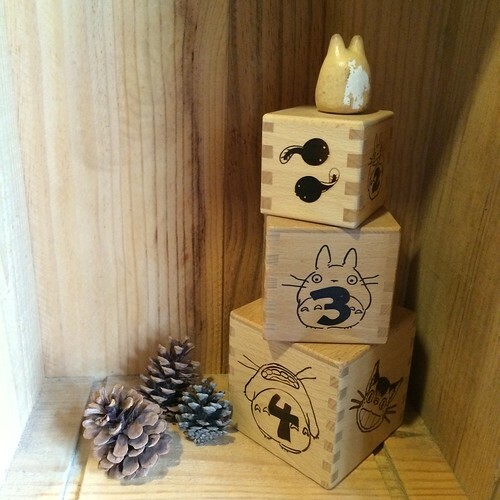 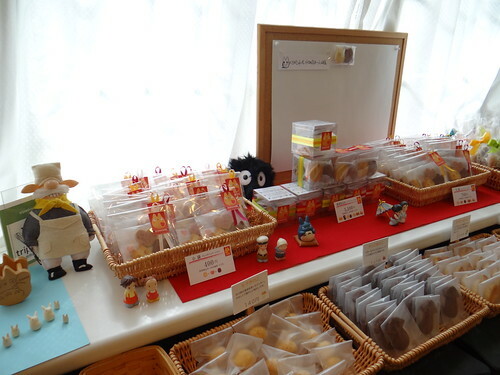 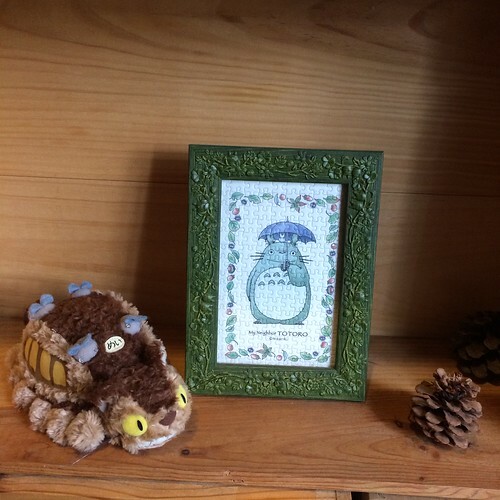 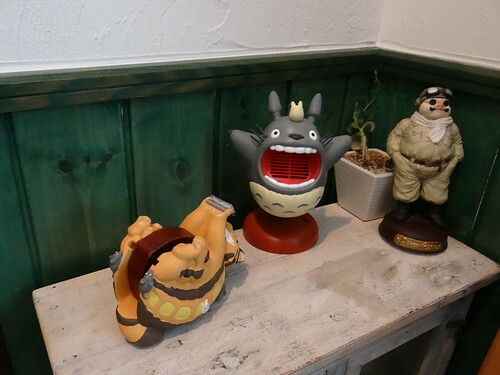 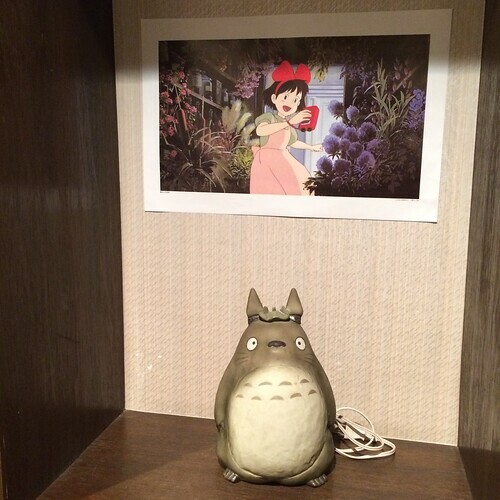 Once you're inside the tiny shop, there are more Ghibli artefacts which are worth having a look at before you turn to the fabled Totoro Cream Puffs themselves. 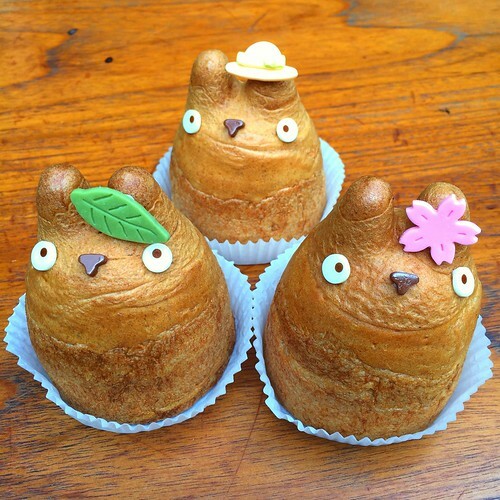 Cream puffs are basically choux buns filled with custard or fresh cream - like profiteroles without the chocolate sauce. 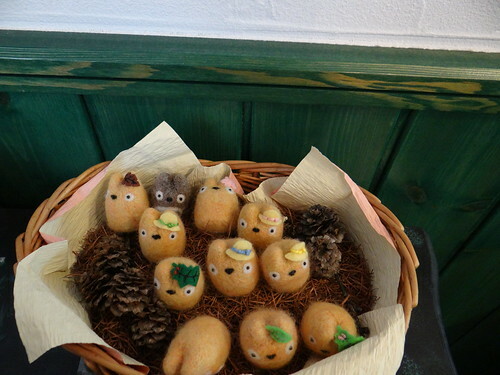 I spotted one of the bakers in the room at the back, carefully adding the chocolate eyes and noses to the cream puffs. 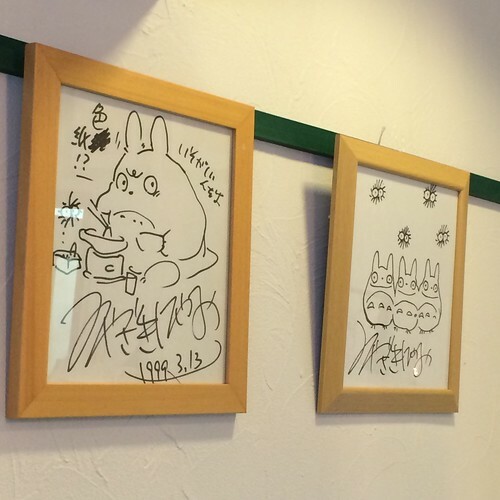 Before getting down to the important business of choosing what to buy, I noticed a few sketches dotted around the walls which I'm assuming were drawn by Miyazaki-san for Shirohige-san. 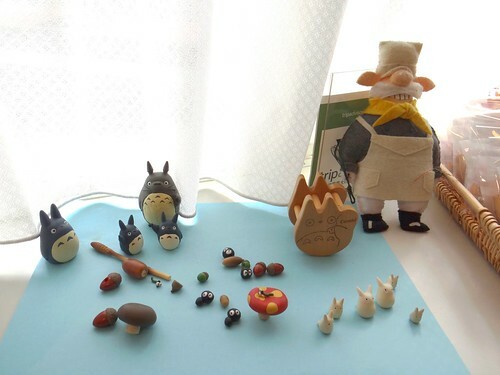 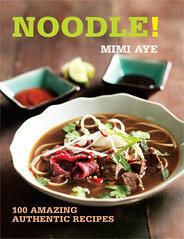 I particularly like the angry Totoro eating noodles. 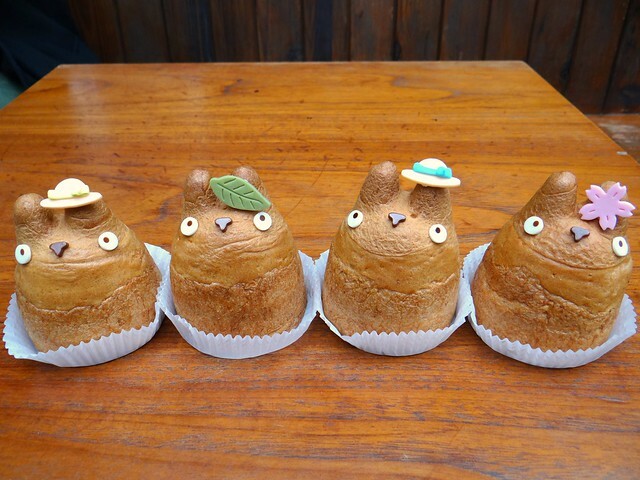 The bakery started off just making the Totoro cream puffs, but they soon branched out into making biscuits shaped like acorns, mushrooms, leaves and of course Totoro. 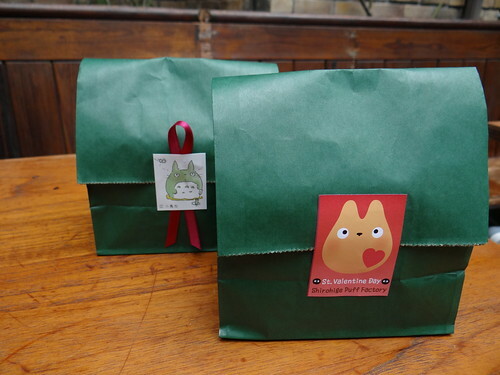 I bought some biscuits to take home as presents and they wrapped them all beautifully. I asked for extra stickers for my daughter to stick in her logbook and they obliged (at least one of the members of staff speaks English fluently). 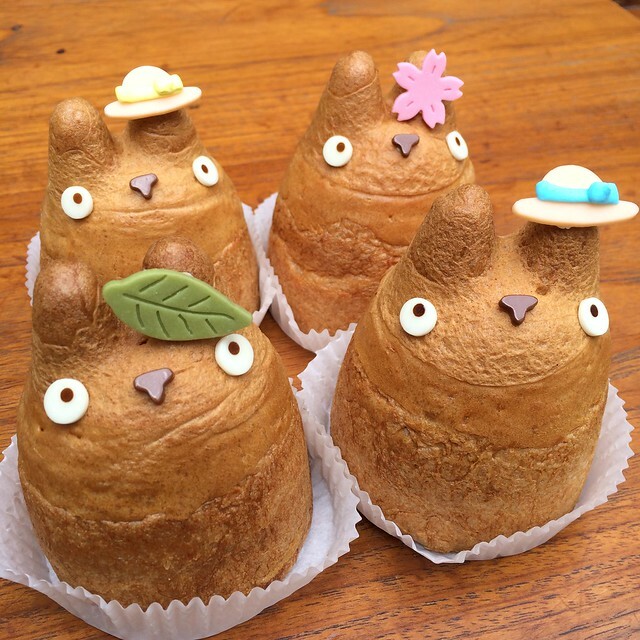 They placed my cream puffs in a cardboard box, again sealed with a Totoro sticker. 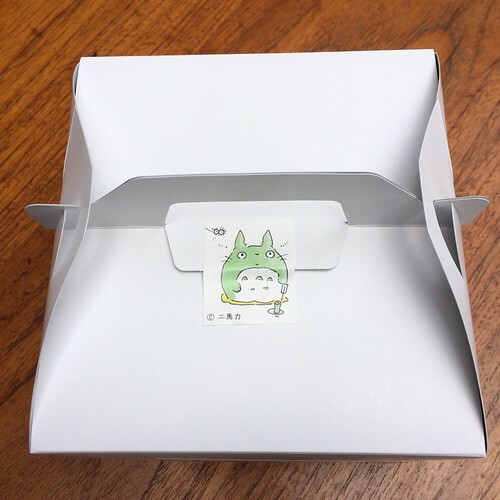 You can also buy an insulated bag to keep the box cool (the puffs are filled with cream after all), but the bags are quite flimsy and to be honest, you won't be able to wait. 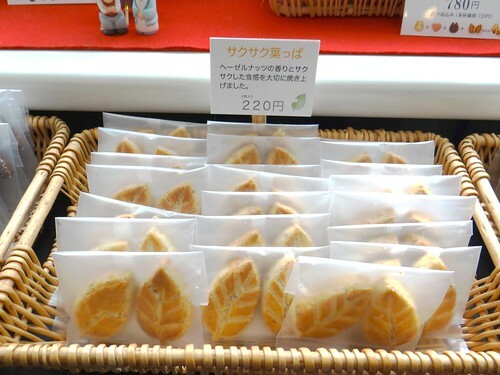 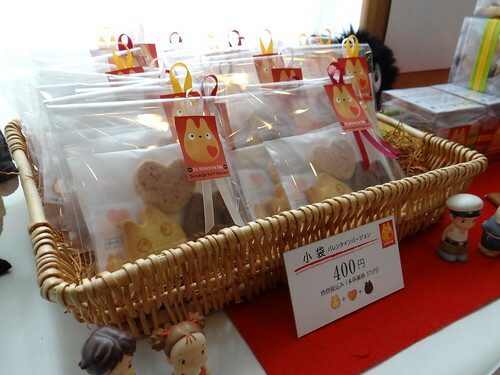 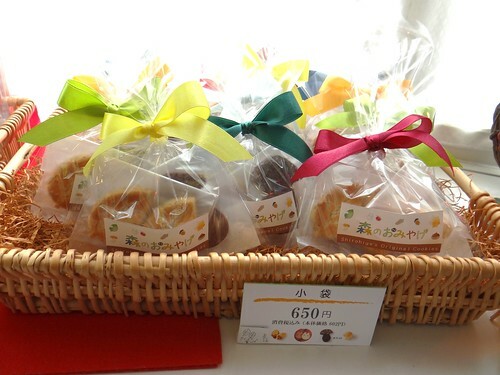 The classic flavours are 400 Yen, the seasonal specials are 440 Yen. 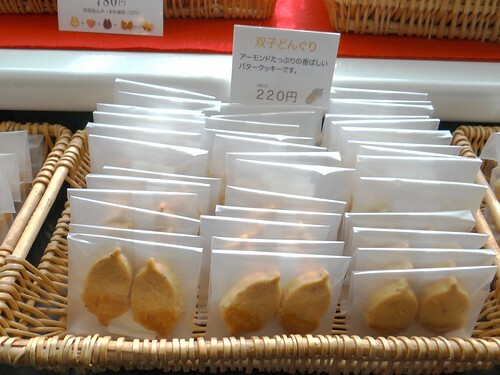 At the time I went, the exchange rate was 175 Yen to the pound, so this was the equivalent of £2.30 and £2.50. 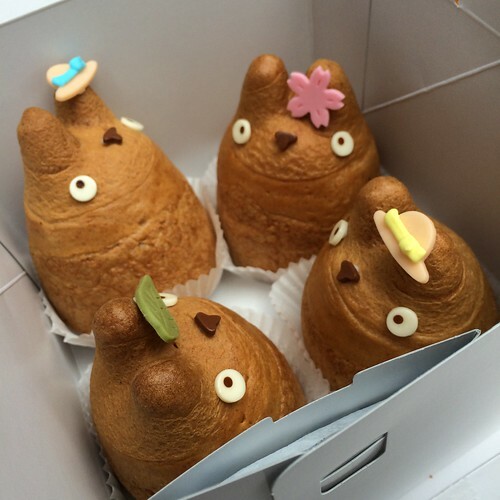 They have seasonal variations, but the cream puffs we bought were vanilla cream (the green leaf), chocolate cream (the blue ribbon hat), strawberry cream (the pink flower) and caramel banana (the yellow ribbon hat). 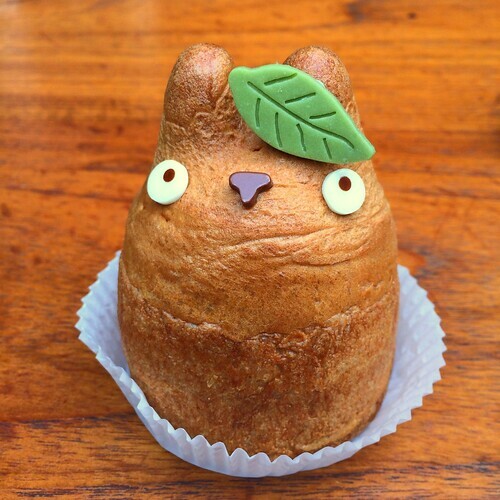 I've seen an Autumn special which is chestnut cream (a brown leaf) - I'll have to come back in October! 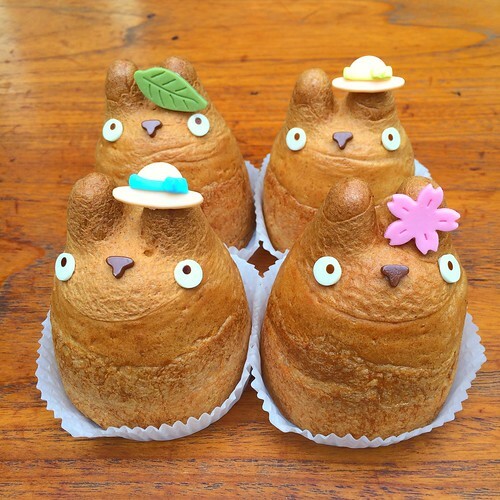 The wonderful thing is that not only are they beautiful, the puffs are genuinely delicious. 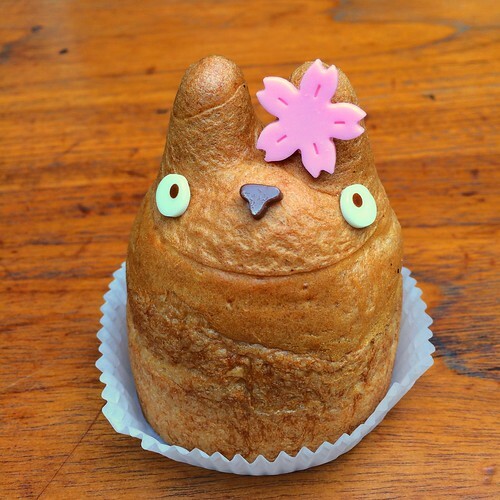 The strawberry cream is a stunning seasonal special - it's actually got teeny chopped-up strawberries and strawberry puree rippled through the cream. 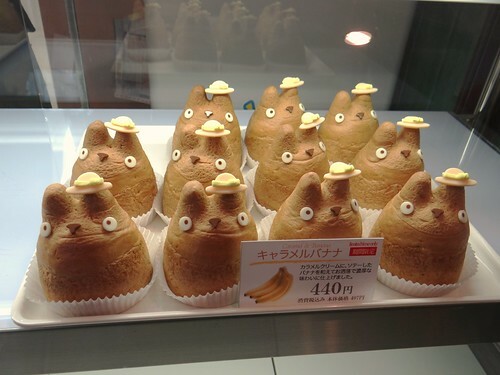 The caramel banana is another seasonal special and was my favourite. 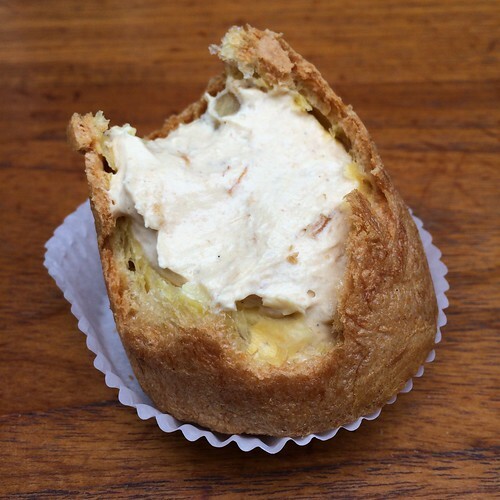 Caramel sauce and banana puree is swirled through cream with chopped-up banana chunks. 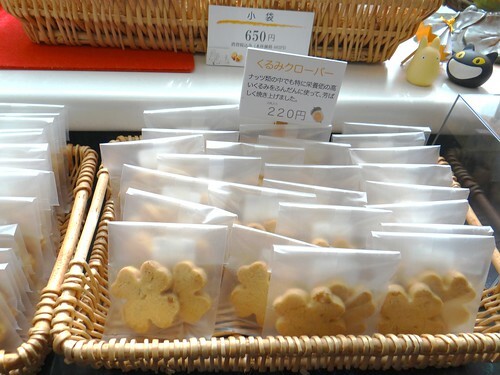 The vanilla cream is the original flavour and you can see and taste the vanilla - the cream is dotted with black flecks. 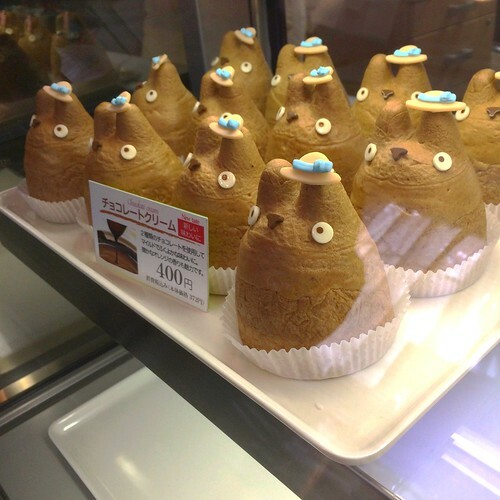 The chocolate cream was actually my least favourite, as it just tasted like a chocolate mousse. 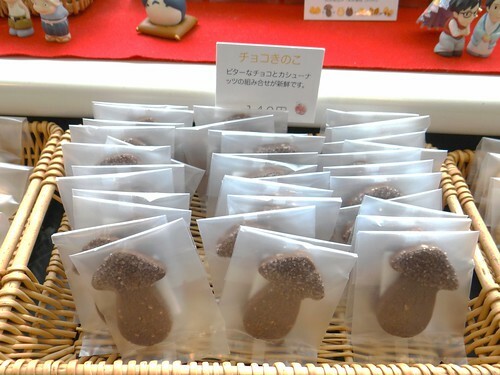 Tasty enough, but not nearly as good as the others. 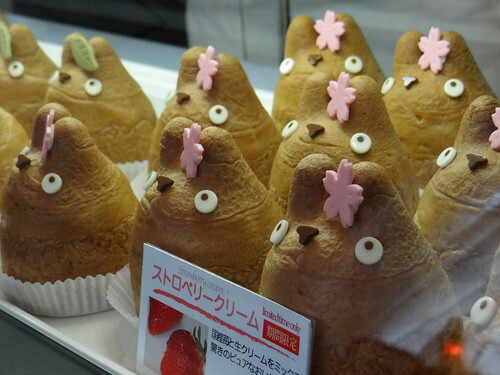 Weemalee thoroughly enjoyed it though, as you can see above. 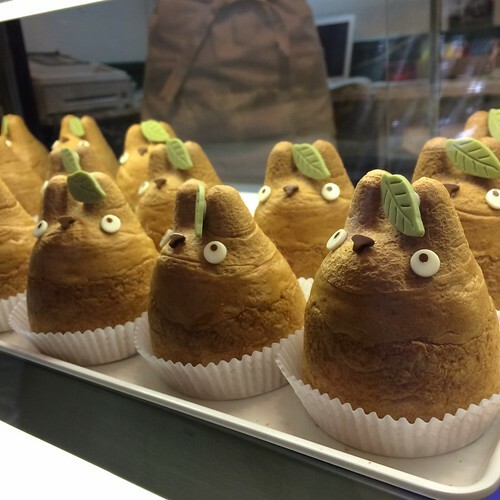 There is a little café upstairs called TOLO which serves the Totoro cream puffs, as well as other sweets and savoury snacks. 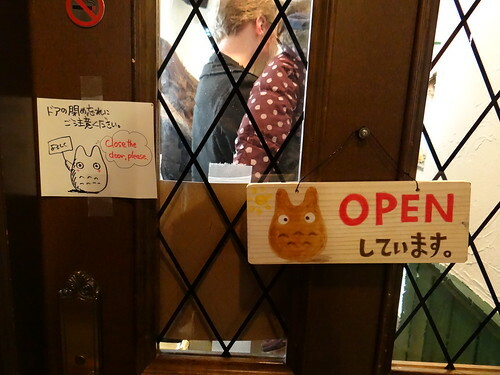 We didn't go, as we ate our puffs at the tables outside. 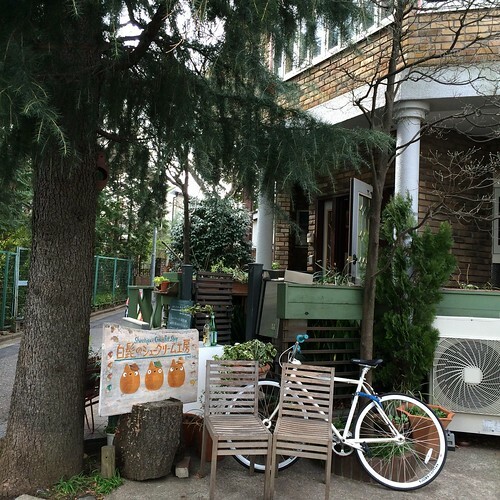 I did use the facilities though, which are as adorable as the rest of the place. 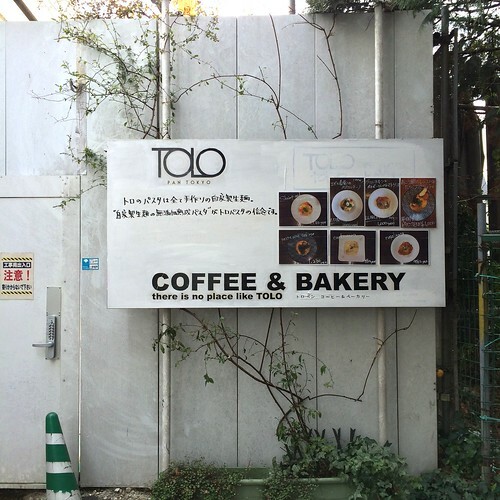 Below is the sign for the TOLO Café upstairs. 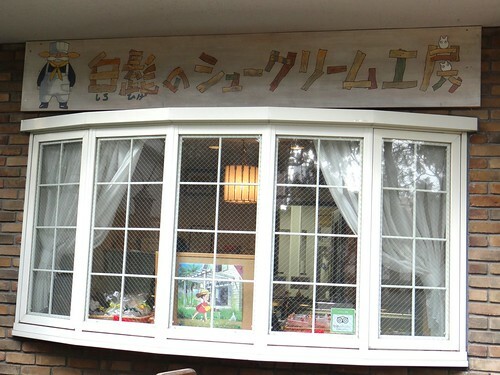 As you approach, it's the first thing you see, which is why we thought we were lost as it has no mention of the Shirohige Cream Puff Factory downstairs.